Description: This fit-and-flare offers additional coverage to our Della style. 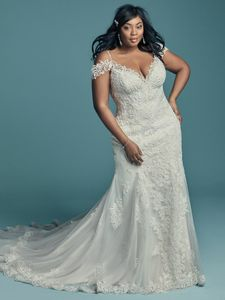 Beaded lace motifs and Swarovski crystals cascade over tulle in this fit-and-flare wedding dress, featuring an illusion double-lace train. Beaded spaghetti straps complete the illusion plunging sweetheart neckline and illusion scoop back, both accented in lace motifs. Attached cold-shoulder sleeves accented in lace motifs can be removed easily to fit a bride‘s preference. Finished with covered buttons over zipper closure.